A cylindrical firing chamber is made out of high quality Alumina mixture. This chamber is covered with insulation material and finished with stainless Steel outer cover. The chamber has a capacity of 450 cm3 to place three alumina crucibles of suitable type. A set of specially designed gas burners (2 Nos.) 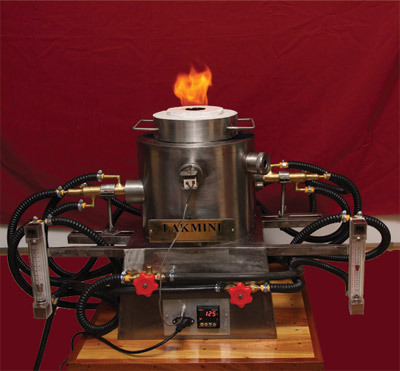 can heat the alumina chamber. The water flow cooling system protects the burner and the frame of the furnace with continuous water flow through outer most layer of the burner and the basement of the furnace. One view hole and facility to feed extra gases (either Nitrogen or Hydrogen) is provided with all models. Alumina Crucibles : Non precious gem stones are placed in these crucibles and then the crucibles are placed in the alumina chamber of the furnace for heat treatment. Different types of crucibles are used for different applications. Cartable Powder : (HAC 96, HACM 96): These powers are used for miner repairs of the firing chamber by mixing with water, when it is necessary. Insulation Bricks : These bricks are used to cover inlets of the firing chamber after firing is completed.